It's been a rough week for golf legends. Earlier this week it was 92-year-old Charlie Sifford, and Saturday 83-year-old Billy Casper joined him. Casper had been having some health problems over the last year, beginning when he passed out at the Masters last year, had pneumonia over Thanksgiving, and had been going to cardio rehab over the last four months. Even so, his family said he was doing well until he started feeling bad this past week. At least when the end came, he was with his family and it came quickly and painlessly. Unlike Charlie Sifford, whose golfing performances in his prime -- or even on the Champions Tour -- are rarely replayed so those of us too young to remember can appreciate them, Billy Casper's game is a bit more familiar. It's not just because he was a bit younger or even because he won more (51 times). In fact, Casper didn't get that much attention when he was in his prime because "the Big 3" of Palmer, Nicklaus and Player garnered the TV time. But Casper did win 3 majors and one of them -- the 1966 US Open -- was the biggest comeback in US Open history... and it was at the expense of one Arnold Palmer. Palmer entered the final 9 at the Olympic Club with a 7-stroke lead, only to have Casper run him down and then beat him in an 18-hole playoff. That kind of thing will get you a lot of TV time, even years after it happened. 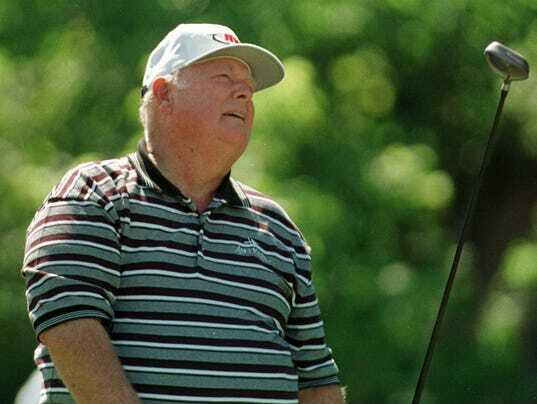 "Billy Casper was one of the greatest family men -- be it inside the game of golf or out -- I have had the fortunate blessing to meet," Nicklaus said in a Facebook post Saturday night. "He had such a wonderful balance to his life. Golf was never the most important thing in Billy's life -- family was. There was always much more to Billy Casper than golf. But as a golfer, Billy was a fantastic player, and I don't think he gets enough credit for being one. I have said many times that during my career, when I looked up at a leaderboard, I wasn't just looking to see where a Palmer or a Player or a Trevino was. I was also checking to see where Billy Casper was. "Billy had tremendous confidence. He just believed in himself. You knew when you played against Billy Casper, Billy would not beat himself. You want to talk about someone who could perform under pressure, if you wanted someone to get up-and-down for you, Billy Casper was your man. I think it is fair to say that Billy was probably under-rated by those who didn't play against him. Those who did compete against him, knew how special he was." Golf has lost two great players -- two great men -- this week. The new kids will have some big shoes to fill going forward. The photo came from this USAToday post about Casper's passing.